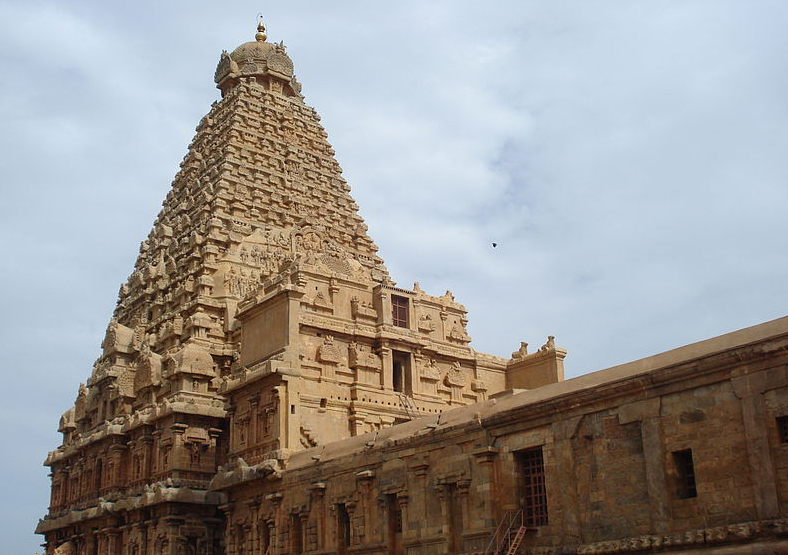 Although there are numerous regional variants of the architecture of the Hindu temple, they can basically be classifed under the Nagara or the north indian and the Dravida or the south indian styles. 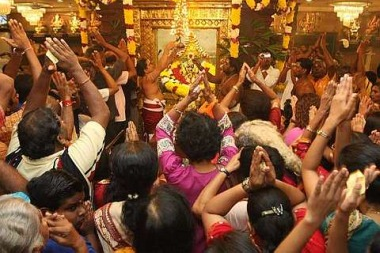 We will briefly examine aspects of these styles (as explained in ancient texts like the Mayamata, Tantrasamuchchaya and Suprabhedagama) and their commonalities. 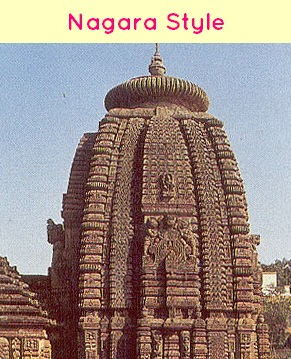 The Nagara style is characterized by a beehive shaped tower (called a shikhara) made up of layer upon layer of architectural elements such as kapotas and gavaksas, all topped by a large round cushion-like element called an amalaka. The plan is based on a square but the walls are sometimes so broken up that the tower often gives the impression of being circular. The central shaft could be surrounded by smaller secondary shafts called the Urushringas, creating a spectacular visual effect resembling a fountain. 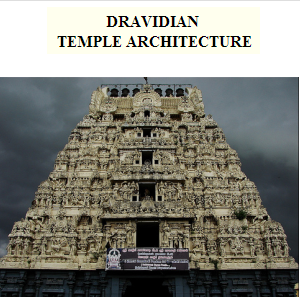 The Dravida Style is characterized by a pyramid shaped tower consisting of progressively smaller storeys of small pavilions, a narrow throat and a dome on the top called the Sikharam or the Vimanam. The repeated storeys give a horizontal visual thrust to this style. 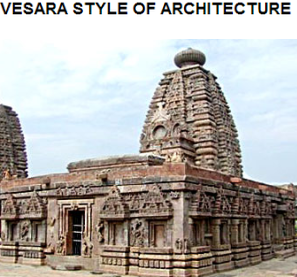 This is the name given to an architectural style that evolved in Karnataka during the medieval centuries and combined both the Nagara and the Dravida styles. 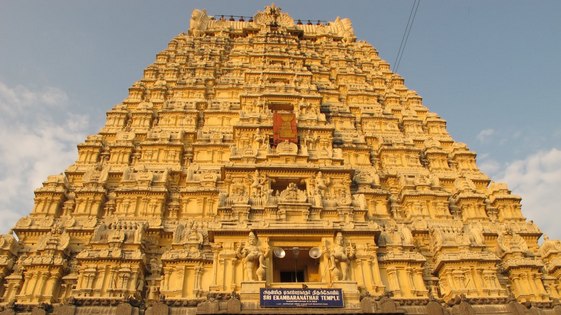 This style reduces the height of the individual tiers without reducing their number resulting in a reduction in the height of the temple towers. 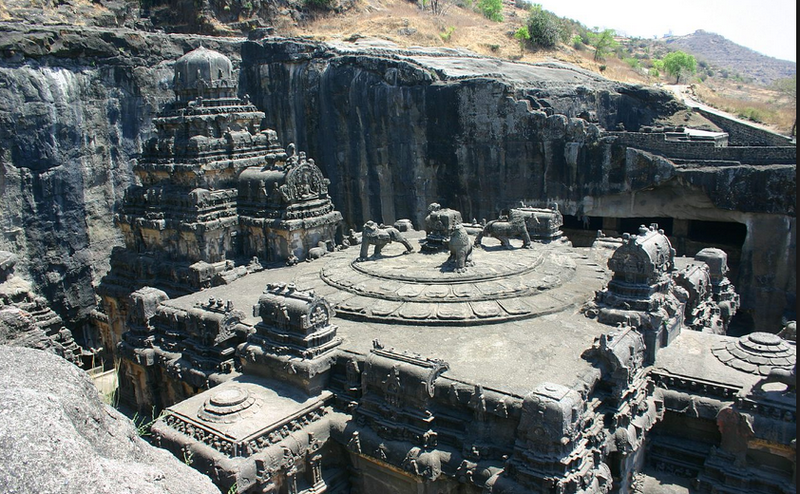 The semi-circular structures of the Buddhist Chaityas are also incorporated in some of the temples of this style. 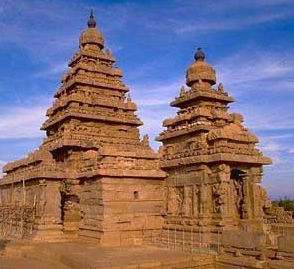 The temples of Halebid, Belur, Somnathapura and Pattadakal are some of the examples of this style. 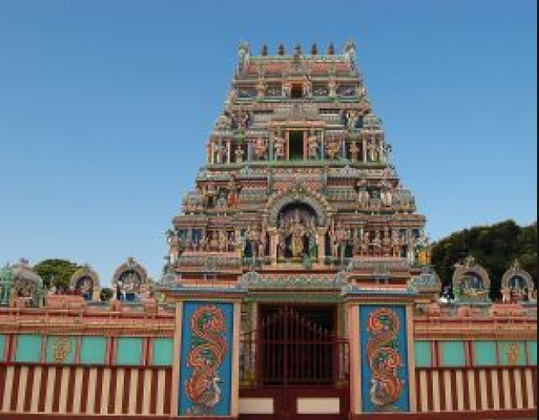 Hindu philosophical and metaphysical concepts dominate the architecture of the temple whatever it’s style. 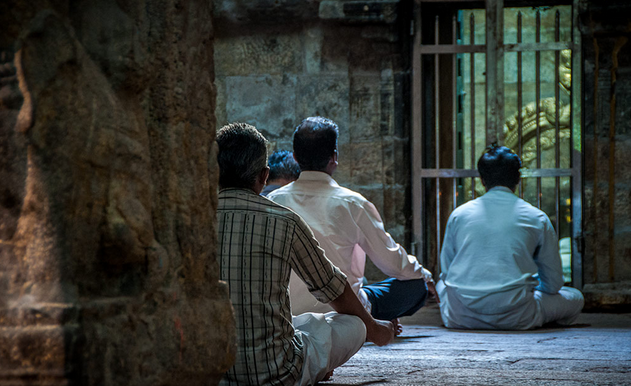 The basic layout of a temple can be visualized as a Mandala, a miniature representation of the cosmos. The Mandala is a mystical Hindu symbol represented by a square enclosing a circle. 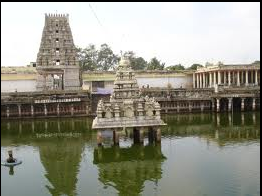 The square denotes not just the four directions but also a perfection of form and symmetry making it de rigueur for temple architecture. The Mandala is subdivided into a grid of smaller squares; 64 and 81 are the most commonly used. Each square is invested metaphysically with a resident deity. 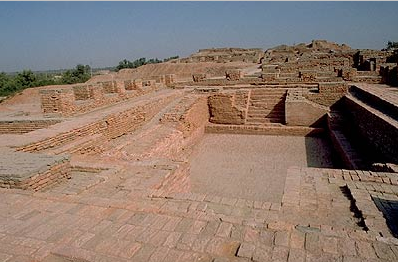 Each component of the temple is then sited on a particular square. A Mandala that forms the basis for a temple’s layout is termed a Vasthupurusha Mandala. 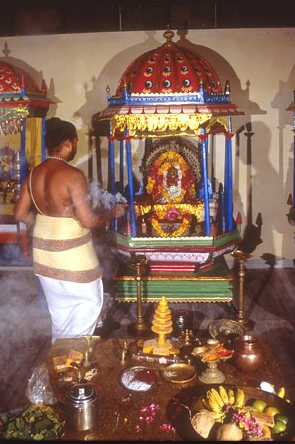 A temple usually consists of the following parts: the Garbhagraha (or the Sanctum Sanctorum) containing the diety, the Vimana/Shikhara, the tower rising over the Sanctum, the Mandapa in front of the Sanctum, the Prakaras around the Sanctum and the Gopura, the gateway(s) to the temple. 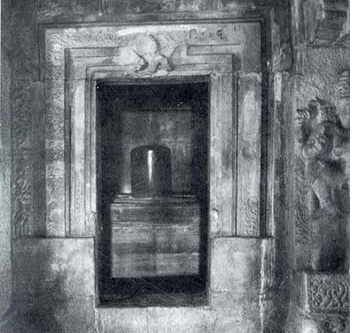 The layout of a temple can also be analogous to the human body. 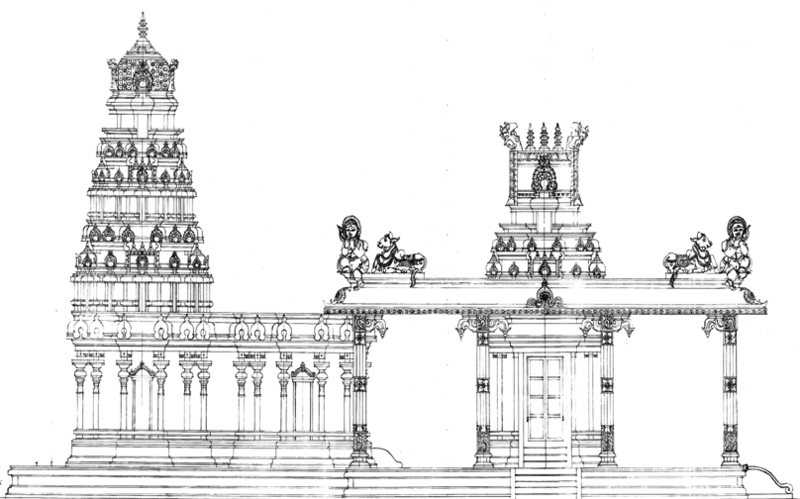 The vimana is the head, the Sanctum is the neck, the front mandapa is the stomach, the prakara walls are the legs, the gopura is the feet and the Lord in the Sanctum is the Soul or the Jiva of the body. 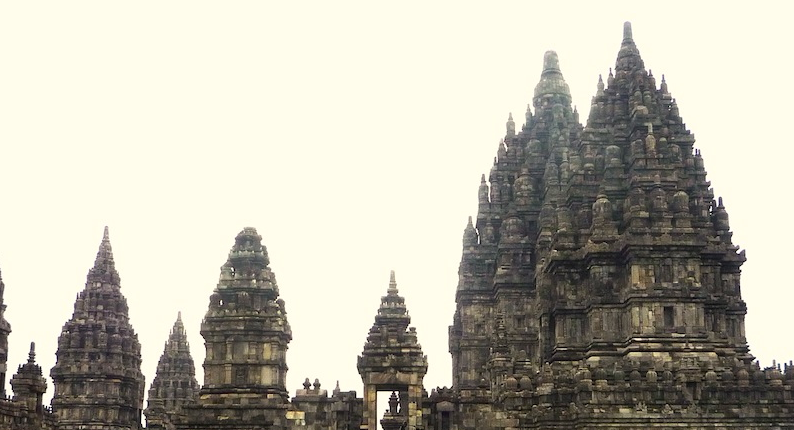 The famous Angkor Wat of Cambodia, the largest Hindu temple in the world, is a combination of Dravida and Khmer styles of architecture while the massive Prambanan temple complex of Java, Indonesia follows the Mandala precepts of Vasthu Sastra while it’s soaring spires are reminiscent of the Nagara Shikharas.